.......53 Buddhas and Me .................My Life Adventures.....: "International Angel Day 2009"
I had the best day yesterday at the "International Angel Day" at Eltham Living and Learning Ctr. It was a day to experience and celebrate connecting with your Angels; Oracle Card or Tarot Readings, Reiki and other Holistic Healings. It's amazing at events such as these, no matter how many people are there it still has a peaceful feeling. I had the pleasure of having a sample of Bowen Therapy by Denise, my Palm Read, another sample of Reiki and then to what had to be the highlight of my day. I had this beautiful Guide Drawing done by "Shiona". 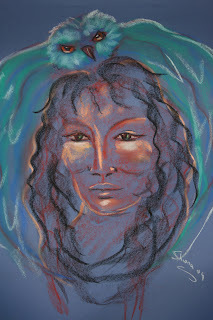 Not only am I privileged to have a drawing of one of my guides but she is a "Gypsy" and also she is my "Higher Self". She has an owl surrounding her. I am going to have to "google" the meaning of the owl. I will say it again my life is in such a great place at the moment. It sounds wonderful Davine, quite the experiences I must say! Does the owl not mean wisdom? I am curious, please do let me know when you find out, thanks!